Known as the Grand Old Lady of Shuter Street, Toronto’s Massey Hall has long existed as one of the city’s most iconic cultural fixtures. Celebrated for its rich acoustics and ornate interior, the intimate concert hall has hosted some of the century’s greatest musical minds. From opera stars such as Albani and Caruso to celebrated jazz musician Oscar Peterson, musical prodigy Glenn Gould, and even rock ‘n’ roll greats like Neil Young, many have graced its unrivaled stage. Over the course of its more than 120-year history, Massey Hall has become the site of countless gatherings, classic performances, speeches and sporting events, and in turn woven itself into the fabric of the city’s very identity. Officially established in 1894 by local manufacturing tycoon Hart A. Massey, Massey Hall was built in memory of Hart’s son Charles who died tragically of typhoid in 1884. At that time, Hart Massey, who had inherited his own father’s agricultural business decades prior in 1856 and built it into the hugely successful equipment manufacturer it had become, actually held the Ontario production rights to an assortment of reapers and mowers, which led the company to achieve international recognition. Charles, who at the time of his passing was a partner in the family business, was also an accomplished organist and pianist. To honour his life, the Masseys decided to gift the city of Toronto––a place where they had done a great deal of business––with $100,000 (an equivalent of almost $2,000,000 today) for the purpose of building a community concert hall. Massey Hall was originally created to house “musical entertainments of a moral and religious character, evangelical, educational, temperance, and benevolent work.” Despite their fortune, the Masseys were explicit in their wishes for the hall­­­­––it was strictly to be used for the benefit of the poor rather than the rich. Denoting that it “not be a money-making property,” the Massey’s also requested that the hall’s expenses be kept as low as possible with revenues being merely intended to cover expenditures and “provide a sinking fund for repairs, insurance” and other things of that nature. Everything beyond that was to be applied to reduce the cost of admission. Over the course of the next 10 years, the Massey family worked alongside architect Sidney Rose Badgley to design Massey Hall. At the time, Badgley had recently completed work on The Cleveland Music Hall in Ohio, and his designs were very much in line with what Hart Massey had envisioned for Toronto. The simple pressed-red brick building with its gently arched roof was eventually erected at the corner of Shuter and Victoria Streets, with additional input from on-site architect George Martell Miller. Though appearing modest from the outside, the hall’s interior was a thing of perpetual beauty. Lavishly decorated, the auditorium featured stained glass windows, horseshoe balconies, and Moor-inspired fireplaces and archways throughout. The ceiling was adorned with giant incandescent and gas lights. Not among the building’s original fixtures are its now-famous exterior fire escapes, which were added in 1911 to address fire safety concerns, or its widely recognizable neon sign. But the hall’s most exceptional characteristic is, and has always been, its incredible acoustics. Largely due to the building’s square shape, many are able to achieve rich warmth in both sound and depth that is unique to Massey Hall alone. 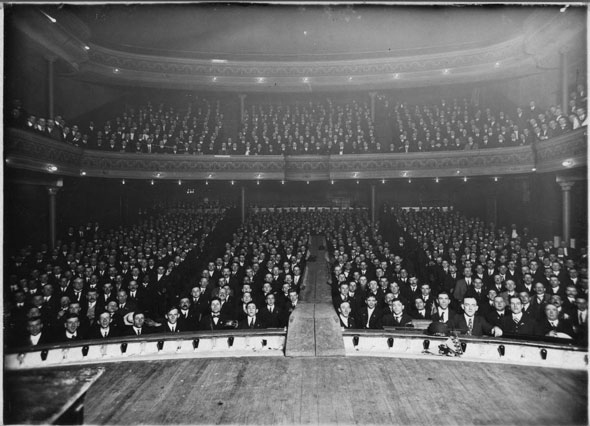 With an official capacity of 2,753––the venue was originally designed to hold 3,500, but seating was reduced after renovations in 1933––Massey Hall was long one of the city’s largest venues. For this reason, it came to serve many different purposes. Among the hall’s very first residents were the Toronto Symphony and the Toronto Mendelssohn Choir, however, it was soon after used to screen films, to house touring opera, ballet, and theatre companies, and for regular exhibition-boxing matches, as well. In its early days, Massey Hall also hosted many great orators, such as wartime hero Sir Winston Churchill (1900, 1901), and feminist, politician, and social activist Nellie McClung (1919). During the early part of the 20th century, the hall was used as a gathering place for both striking railroad workers and the women of the suffrage movement. But, probably most significant was its relationship to the temperance movement of the 1920s when the import of alcohol was cut off by provincial referendums. As a result, all alcohol was banned on the premises for 100 years; not a drop was served until the basement bar, Centuries, was constructed to commemorate Massey Hall’s 100th anniversary in 1994. 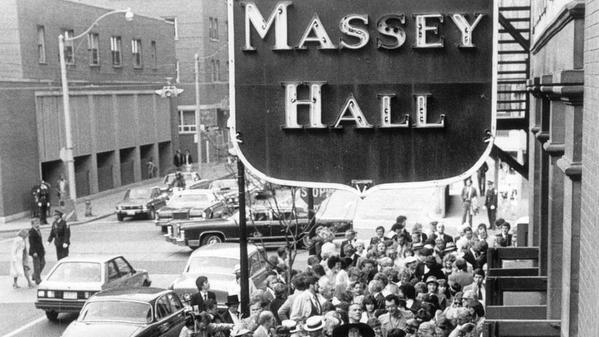 Most famously, in May of 1953, Massey Hall became the site of what is now considered a seminal moment in jazz music history. It was on that evening that the all-star line-up of Bud Powell, Max Roach, Charles Mingus, Dizzy Gillespie and Charlie Parker shared the stage for the first and only time in their careers. The performance they gave that night was absolutely electric, and few were lucky enough to have witnessed it live. Over the years, Massey Hall also became the site of several legendary live recordings, including Neil Young’s Live at Massey Hall––which would go unreleased for more than 30 years––and Rush’s All The World’s a Stage, which went on to sell over 1,000,000 copies. Celebrated Canadian folk singer-songwriter Gordon Lightfoot also has extremely close ties to the venue, as he is the most frequently appearing artist in all of its history. A tradition for Lightfoot that stretches as far back as 1967, he has referred to Massey Hall as “the centre of [his] universe as a musician,” and was even awarded the inaugural Massey Hall Honours on stage during a recent four-night run. Although it wasn’t until 1973 that Massey Hall was officially protected under the Ontario Heritage Act, and 1981 that it was designated a National Heritage Site of Canada, today the hall exists as one of the city’s oldest cultural landmarks of its kind.